TheStreet catches up with the legendary designer on retail, emojis, and North Korea's nuclear threats. Shares of Macy's Inc. (M - Get Report) have recently taken a nosedive, but amid the struggles the retailer has had no trouble nabbing one of the most prolific American designers for a collaboration. 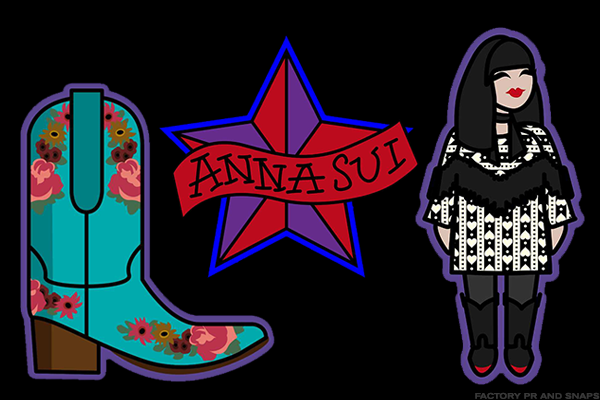 It's no wonder that Anna Sui, the designer at hand, is less than troubled about Macy's days ahead. An "institution," she calls the department store -- one that won't be going away anytime soon. Sui built an empire out of her living room over three decades ago. In 2009, she earned a lifetime achievement award from the Council of Fashion Designers of America. Known for her bohemian frocks and 70's rock-and-roll aesthetics, her life's work is currently on exhibit in London's Fashion and Textile Museum, the first time a living American designer has been the focus of an entire retrospective in the U.K. In addition to her partnership with Macy's, the fashion icon also has a furniture line at Pottery Barn. Her collaboration with Macy's in-house brand, INC International Concepts, launched this week, along with a suite of custom emojis to match her pieces. TheStreet caught up with Sui on the eve of New York Fashion Week 2017 and got her take on retail, emojis, and what catastrophe Trump could wreak for the fashion industry. Macy's actually was the first retailer I ever worked with, in 1981. I created five pieces for a show and got orders with Macy's. This most recent project was kind of a fluke--they wanted some Western-inspired pieces and saw my 2017 collection and reached out. I like your emojis for the collection! But what's your favorite classic keyboard emoji? I like the hearts, with all the colors! And the birthday cake one. Pretty predictable. What's your take on the retail apocalypse? People say this is the end of retail. I think retail will be okay. In the end, people will always want to buy clothes, try them on, touch the fabric. I think of the [Macy's I.N.C.] woman, who's interested in looks from the runway and all the different styles but at a certain price point. People also love the element of finding a treasure, of discovering something very special. Are you worried about Macy's, given its declining sales and revenue? No, not really. I think we'll always needs these institutions, the department stores like Macy's. Because retail can't just be fast fashion and discounters. So, you are a first-generation American. How do you see President Donald Trump's policies affecting the fashion industry, like most recently with DACA? North Korea terrifies me. I'm nervous about what Trump said about cutting trade with any country doing business with North Korea, because I have textile factories in China. All my zippers are made in China. Cutting trade would be awful for my business. And it's so sad about the Dreamers, they all have so much promise. There's a lot of frustration we feel, frustration that Congress needs to get its act together but so far they haven't. What can you tell me about your upcoming runway show? I can say that this collection is about optimism--the optimism that we've been craving in the political climate. I've been working with artisans. I think focusing on craftsmanship and artisan-ship is really important right now, because we're obsessed with technology. How about something hand-drawn or embroidered? I'm working with this Peruvian embroiderer right now, for instance. It's been great discovering these artists.